Please note: This page contains three data sets. The first is from September 1, 2005. The second is from September 3, 2005. The third is from September 11, 2005. The final set is the most comprehensive, though no map has been generated yet due to the size of the data block collected. 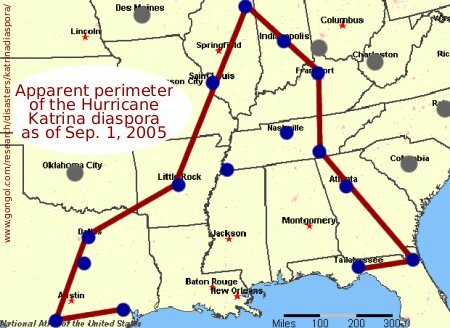 The above locations formed the perimeter for major evacuee settlements as of September 1, 2005. Major media in cities like Oklahoma City, Kansas City, Des Moines, Cincinnati, Charleston, Raleigh, and Columbia didn't feature stories about large numbers of evacuees settling in those communities by September 1st. Major cities apparently forming the perimeter of communities not yet reached by the diaspora as of September 3, 2005, include Phoenix, AZ; Albuquerque, NM; Sioux Falls, SD; Milwaukee, WI; Cheyenne, WY; Columbus, OH; Cleveland, OH; Charleston, WV; Washington, DC; and Richmond, VA. The approximate sum of the confirmed values above is about 416,000 people -- which, given the magnitude of the disaster and resulting diaspora, is probably the most reasonable estimate possible based on the available information. The United States simply doesn't have a modern experience with a sudden, mass migration of this magnitude. 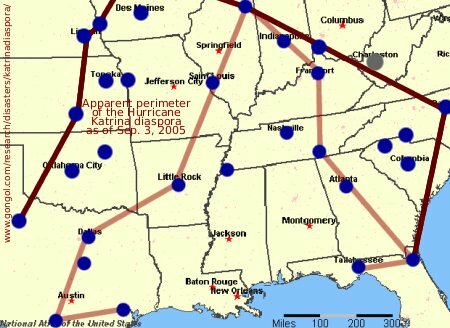 While much of the immediate humanitarian response to Hurricane Katrina focuses on moving resources to the immediate area of the disaster, the migration of thousands of people to new locations on a semi-permanent basis is going to expose lots of important things about the nation's economy. Are the local economies to which those evacuees moved robust enough to handle the influx of hundreds, thousands, or in some cases, tens of thousands of people? With sudden spikes in demand for food and basic consumer goods (as in Dallas and Houston, where the number of evacuees is in the thousands), will there be local price shocks? How will those local areas adapt to the arrival of people with little or no savings or other capital? How long will it take to absorb the employable members of the migration into the job market? Will some cities and states prove capable at moving some of the evacuees into employment who were unemployed or underemployed at home in New Orleans or elsewhere in the region? How many of the evacuees will permanently relocate to the places they were resettled? Since we already know that a significant possibility of a serious terrorist attack on a major American city exists, the exodus from New Orleans and nearby parts of the Gulf Coast are essentially writing the book for next time. The importance of what we learn now shouldn't be underestimated.